Wedding planning is full of beautiful milestones (choosing your fabulous attire, asking loved ones to stand up with you…) but also hard reality-checks. The real cost of planning a wedding is one of the most difficult aspects, and it can be difficult to understand exactly WHY things are priced a certain way. As a consumer, it’s your right to know what your money is buying. That said, there are a lot of misconceptions about the cost of fresh florals, and I wanted to take a moment to let you in on exactly WHY that “Pinterest-worthy” centrepiece costs what it costs. And to give you a better idea of where your the price comes from, I’ve photographed this blue and purple wedding centerpiece at its base form, at a moderate price point, and at a luxury price point. Let me preface this by stating that this isn’t a low-budget arrangement. I chose primarily mid-range blooms and foliages, with a few speciality items. 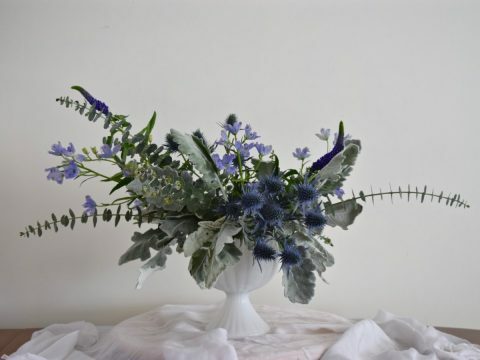 My base consisted of dusty miller (a personal fave for wintery pieces), baby eucalyptus, blue thistles, lavender larkspur, and purple veronica. The vintage milk glass compote vase is a rental item from my inventory, and runs about $10 per vase. Frankly, I think it looks pretty already! One of the things I love about the FloraGuppy is that it is transparent, so it’s a lot easier to hide your mechanics (and this is NOT an ad – just a shoutout to a great new Canadian company who has our planet’s best interests at heart). The other great thing about this base is that you could take this palette in a lot of directions. Add some white and it would be gorgeous and simple. A deep raspberry would bring it towards summer. Add some browns and caramels and you have a frosted, wintery feel. For lower-budget brides, I’d recommend adding some fluffy carnations and maybe some tulips are your focal flowers. That would bring you to around $85 per centrepiece, which is pretty reasonable (when you consider that that includes markup and labour). But let’s carry on. To bring this to a $100 price point, I would add a few lavender roses (“Cool Water” for those who want specifics) and lavender tulips. Both choices are relatively economical. One thing I did here was to “reflex” the rose to give it more open look. 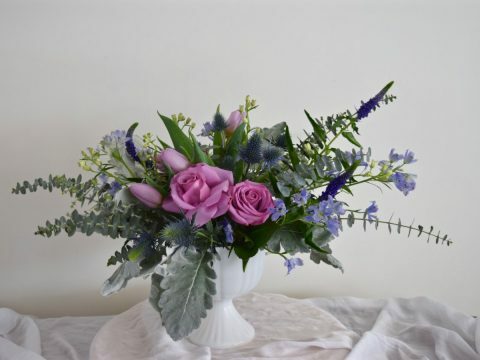 This is a great way to trick your guests into thinking you sprang for bigger blooms! 😉 Check with your florist to see if they can do that. I purposely put a reflexed rose next to a non-reflexed rose, just to give you an idea of the difference in look and size. They almost look like two different varieties, no? 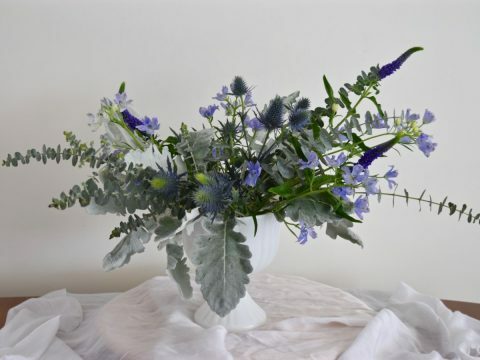 One of the reasons I recommend going with some higher-end “filler flowers”, like the blue thistles (which aren’t all that pricey, really), or the lavender larkspur is that it really gives beautiful texture and adds a lot of depth to the arrangement. If you want that Pinterest-worthy, more designed look, you need a range of textures. Plus, the higher-end stuff is often larger, and covers better, so you end up needing less. Now let’s take this up to the next price point.. The addition of the bright blue delphinium adds a lot to it, as does a few more stems of the deep purple veronica. 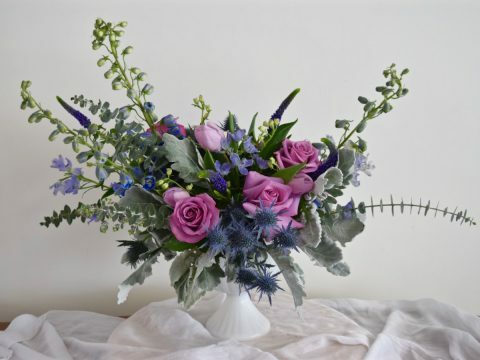 More roses adds a bigger dose of lavender and of course a lusher look. 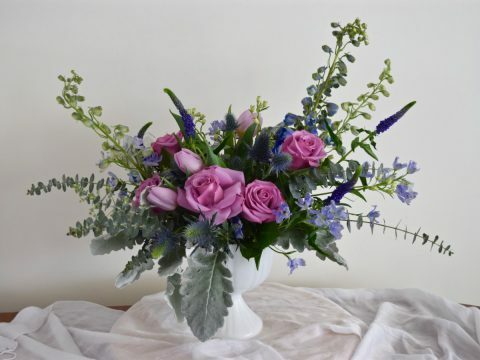 Delphinium are one of my favourite flowers, especially for a garden-style wedding. Larkspur is a close relative, but with an airier look. I hope that de-mystifies the cost of similar centerpieces. Please bear in mind that every business uses different pricing structures, and that not every florist will charge exactly the same amount for a similar piece. A lot of the pricing depends on the local market, wholesale prices, geographic location, overhead costs, and access to hard-goods. There are industry standards, but there’s no one-size-fits-all for pricing. Seasonality is also a major factor in the pricing of florals: try to work within what is available given the timing of your wedding. Peonies for a September wedding? That’s going to jack the price waaaaayyy up. But dahlias in September? Where I am, they are available locally at a pretty reasonable price. Certain things like roses, hydrangea, and delphinium are available year-round, but climate and political events (like a big storm system, or uncertain oil prices) affect the cost of shipping those blooms. 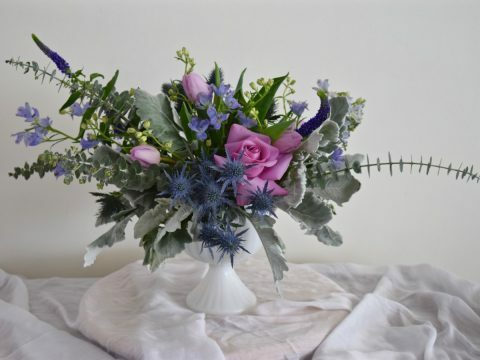 It is always best practice to ask your florist to source what they can from local growers first. Not only is it more ecological, but it supports your own local economy. If you are a 2019 or 2020 couple and are interested in working with me for your wedding florals, please head over to my portfolio page to see more, or click here to get in touch! I can’t wait to chat flowers with you.